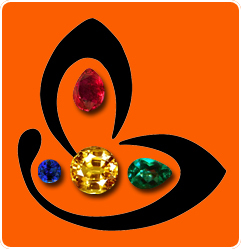 Comments Indeed, this is a fine example of the passion to implement gem therapy to yield the maximum benefits! Both the Cat’s Eyes are of a super premium quality!On the left, the darker gem is a fine 2.12-carat natural Chrysoberyl Cat’s eye from Ceylon, with a greenish milk and honey color, with lovely translucence and a fine and sharp Chatoyant band! Filled with powers as mysterious as the shadowy planet Ketu! 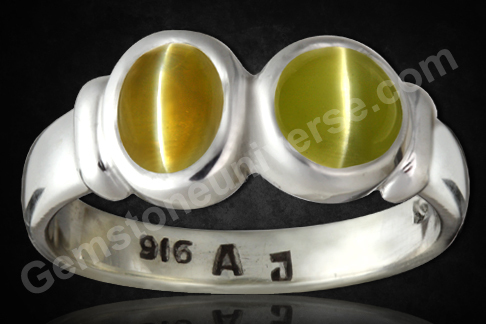 On the right is a lovely and magical Neptune Green colored natural Chrysoberyl Cat’s Eye of 2.05-carat with a rare dual Chatoyant band, which is not only rare but also noble and auspicious! This Cat’s Eye from Sri Lanka is a powerful Sattvik gem with powerful Ketu energies! Set together in a sterling silver ring rearing to deliver the best results of the South Node – Ketu!